I'm someone who picks up gifts throughout the year for just the right occasion, which means I've been shopping for the holidays since August! It takes away a lot of the stress of finding gifts in time to ship them off before December 25 and makes the season a lot more affordable. 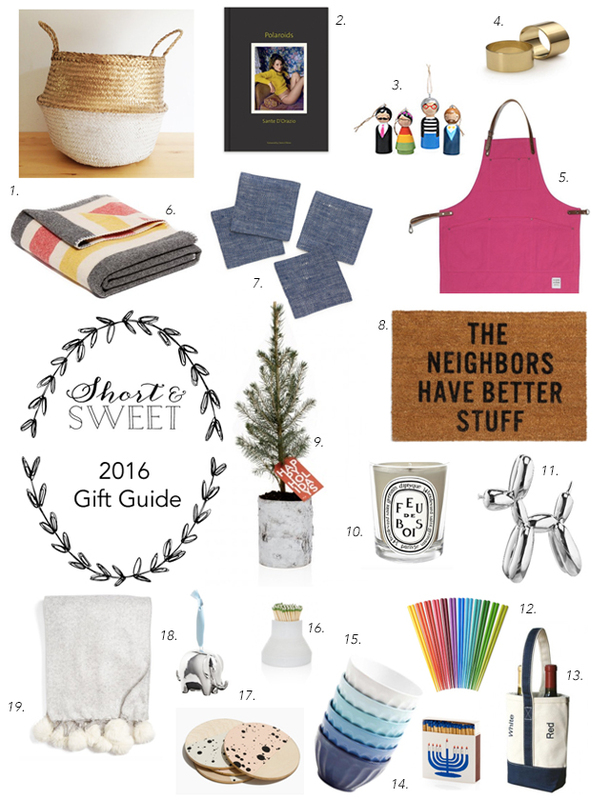 First up: gifts for the home. Whether you're looking to pick up a small hostess gift for a holiday party or gifting a home item for Christmas, there's something on this list. I hope you enjoy perusing the list as much as I enjoyed putting it together. Up next: gifts for gals, whether it's your BFF or sister-in-law. Top Two Rows: 1. You can never have too many baskets. TalaHomeDesign Metallic Gold and White Sea Grass Basket would be perfect to store throw blankets in the living room, bathing suits in the closet, or just as a decorative piece. // 2. Coffee table books are one of my favorite gifts to give (and if I'm being honest, receive). Sante D’Orazio: Polaroids is a conversation-starting coffee table book featuring the personal Polaroids of '90s photographer D’Orazio. // 3. If you haven't checked out the MOMA store for gifts I highly suggest that you do. MOMA Modern Artists Ornaments includes Salvador Dalí, Frida Kahlo, Andy Warhol, and Vincent van Gogh. // 4. Impress your friends with these Solid Brass Napkin Rings from legendary Swedish brass brand, Sultana. // 5. Sure, this Risdon & Risdon Apron is bright pink, but it has leather straps to balance out the femininity. (Also comes in blue and white linen.) // 6. A classic Woolwich blanket is something that anyone one would love receive. I love the strips on this one, which would be perfect for picnics or to curl up on the couch. // 7. You kind of can't go wrong with these Linen Coasters in Blue Chambray. Middle Rows: 8. We have a Reed Wilson doormat and love it. This Neighbors Doormat would make such a great gift for someone with a good sense of humor. // 9. Hudson Grace is one of my favorite shops in San Francisco. I just may have to pick up this Holiday Potted Tree for myself. It's a Colorado Blue Spruce and can be potted outdoors at the end of the season; how cool is that? // 10. I'm a sucker for a pine scented candle and know I'm not alone. Diptyque candles make such lovely gifts, especially the Diptyque Feu de Bois Wood Fire Scented Candle. // 11. Gift the unexpected with this Balloon Dog Figurine Statue (which comes in nearly every color). Bottom Two Rows: 12. Another unexpected gift is this Rainbow Chopsticks Set. Made in Japan, the twelve pairs of reusable wooden chopsticks are such a conversation starter. // 13. If you're bringing wine as a hostess gift, consider bringing it in this Embroidered Canvas Wine Tote. // 14. I love an oversized matchbook. Designed at Hudson Grace and printed in England, these Menorah Matches are the perfect way to celebrate the Festival of Lights. // 15. The Gibson Set of Six Latte Bowls can be used for big lattes or bowls of soup. The the color gradient makes them extra special. // 16. Another gift from Hudson Grace: the Paris Porcelain Match Striker. This is my go-to hostess gift. // 17. Have you seen the Madewell x Food52 collaboration? I. Want. Everything. This Madewell x Food52 Speckled Birchwood Coaster Set would make such a great gift. // 18. Something from Jonathan Adler always makes it onto my gifting list. This Jonathan Adler Metallic Elephant Ornament is part of the Menagerie Ornaments series and I love the idea of gifting one in the collection year after year. //19. Cozy gifts are always welcome this time of year. Anyone would be happy to unwrap this Faux Fur Throw. Right? I may have to pick some up for myself, Jillian!